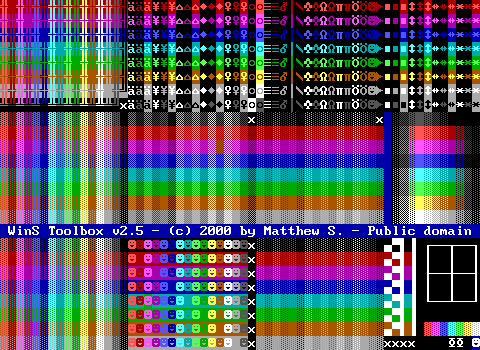 Colors R Us had an ASCII chart because it was that awesome. It crammed all the non characters you couldn't type in ZZT on the board and then had a scroll with all the others. I noticed that, but I didn't see the scroll until just now! I really like the idea of a combined chart/toolkit; I mean, if you can cram all of STK onto one board, why not add an ASCII chart? fun fact: lemmer's ascii chart was the only one i added to z-files (unless a chart was part of a toolkit, like quantum's) because Every Freaking Ascii Chart is the Freaking Same. ascii. ascii never changes. speaking of fire, I wonder how many games include the one object fire board. not really a toolkit, since it only has one object though. That's why I love this chart. It's as impractical as STK, but you'll never see another one like it. Never? It that a challenge? I've been playing with gifsicle, and I'll see if I can throw something together, if someone else doesn't beat me to it. I've spent too much time on this. But that doesn't mean I'll stop! Stay tuned for the bottom-of-the-bag miscellany! When I'm bored I might do something with these screenshots and "average" out all of them. So the first tile would be whatever appeared the most often in the top left corner of every toolkit. Look at that did you get the idea for screenshots from this thread? i like this new screen capture development. 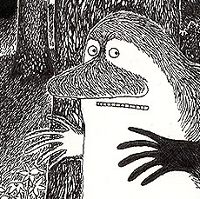 The problem with Tyger is I need to rewrite the oop reading code and find this impossible bug and i'm basically just stalling. It's very easy when I'm bored at work to think of all the AMAZING FEATURES I can implement. 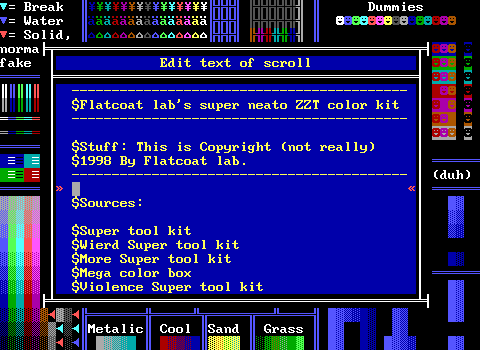 I still want it to be as compatible with ZZT as possible though just so I don't have to make an editor. 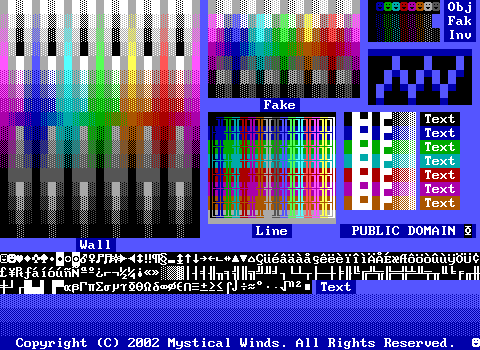 Useless tricks include "well walls with stats don't do anything in ZZT therefore I can use paramater 1 as the wall's character and then CUSTOM SOLIDS"
And then of course there are things that will break compatibility that would own. Like wouldn't it be awesome if #put n white darkred passage 3 would make a white on darkred passage that would take you to the 4th (starts at 0) board? #put n green object Enemy would put a green on black object to the north whose parameters and zzt-oop would then be read from Enemy.txt or something. The thing is what's the point! Also posting from a furry con. I played scrabble with a bunch of AGNPHers. It was an experience. you really don't need to add anything new to it, just make a new zzt that runs natively under vista. that will be enough for anyone. Nicely done with the animated gifs/Tyger development! I'm on it. The statistics-gathering program just finished, but it's going to take another day to convert the raw numbers to lies and propaganda. The statistics are taking a bit longer than I expected, and I was busier this weekend than I anticipated. In the meantime, have a few screenshots of misunderstandings of intellectual property! Trademarks don't prevent you from copying stuff -- they only prevent you from passing other stuff off as the real McCoy. So what he actually said is, "You can rip off my stuff, but don't call it 'Horizon Scale' or 'Impromptu Quiz'." I'm guessing he meant copyright here (though AKWare could probably claim trademarks on the quiz name/music, in addition to copyright on the quiz code). Even with copyright, I'm not sure that he would be able to prevent others from ripping off that horizon scale. As an analogy, fonts frequently (and legally) rip off other fonts, because nobody has exclusive rights to the shapes of the alphabet. 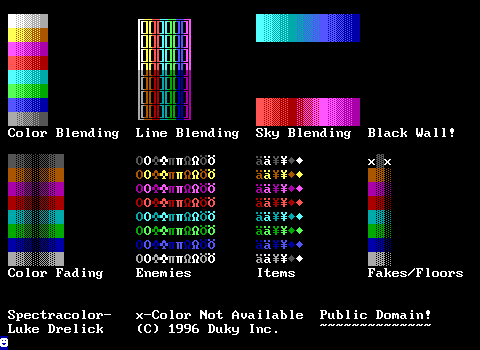 It's kind of hard to lay claim to all fades going from white to blue to green, especially when ZZT limits what colors may be used in those fades. Dexter called the Pepsi name a copyright in another version of this kit, but he got it right here! 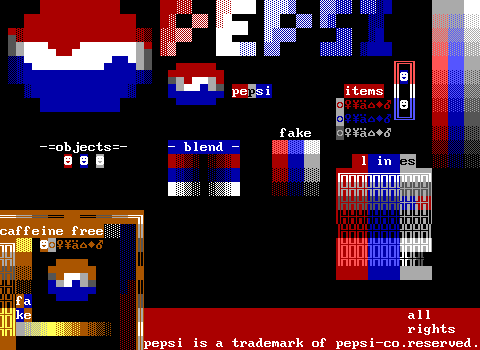 It's probably still a trademark violation, though -- not for the use of the colors, but for the possibility that someone (perhaps someone taking mind-altering substances) might mistake the toolkit as a product of Pepsi Co. There's no problem with claiming copyright, but if you don't have the legal power to back it up, you're pretty much relying on the goodwill of the community to enforce your rights. Somehow, I doubt that Nanobot had an attorney when he wrote this. He eventually released it into the public domain, but confusingly kept the copyright notice, along with the text "All Rights Reserved". Curious. 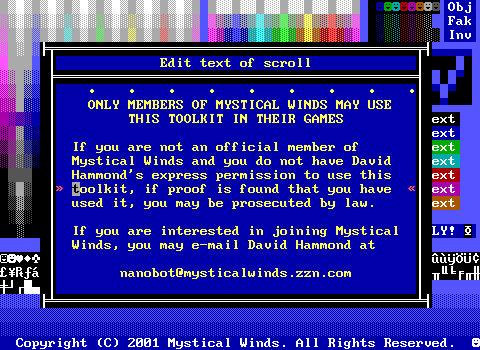 There are six copies of this toolkit in the z2 archive, and 5 of those are in various versions of the Mystical Winds Encyclopedia. The sixth one is in Darkages Remake Demo, which used the public domain version. Lesson: there are worse things than having your copyrights infringed upon. Though Redmage does own the copyright to his toolkit, it's kind of odd to declare that right after his product's name. He probably meant trademark here. Another case where the author, contrary to his belief, actually does have copyright rights (though this might be a statement that he disclaims all such rights on this toolkit). Again, is it copyrighted or public domain? Or maybe it's a clever commentary on how there is technically no public domain, only copyrighted works for which the authors refuse to reserve any rights! Again. It seems like the toolkit authors use copyright notices not to announce that they have rights, but to say who made the toolkit.